I have written a book about Spiritual Activism because I see it as an idea whose time has come. Given the perilous state of the world today, I feel that those of us who are not ill or impoverished or otherwise handicapped, cannot afford to be complacent, and that no matter how busy we may be, we all have a duty to see what we can do to help our planet or ‘make a positive difference’, particularly in those spheres which are of particular concern to us. I see us as all being the midwives of tomorrow and that what you and I do or don’t do today, is going to have a profound impact upon the kind of future that we face, as I don’t believe a better world is going to come about through our world leaders, our generals and bankers or those who generally run our affairs (not least because so many of them are responsible for so many of the messes which are all around us today.) Rather, I think change has to come from below - from the bottom up, from us, the people - and that given these hugely challenging times, it is ever more imperative that increasing numbers of us discover what I call our ‘Activist Selves’. As we do so, we find ourselves being spontaneously moved to champion a cause or causes that especially move us – be it human rights, ending war, cleaning up the environment, saving the whales, promoting organic food, bringing integrity into the corporate world, or whatever. What makes our activism spiritual or what adds sanctity to what we do and aligns our work with the flow of human evolution, is the conscious choice to bring this mysterious ingredient that I will call ‘Heart’ into the equation. This is so important as our hearts are not only full of love but also of wisdom. The great visionary and futurist, Pierre Teilhard de Chardin believed there was ‘more power in the human heart than in the atomic bomb’’. I call our hearts our greatest weapon of mass construction. However, having Heart is not a ‘given’. Our problem today is that too many of us have small, sad and closed hearts and consequently, we live too much of the time in our heads. And this doesn’t bode well for difference making; it doesn’t make for wholeness and resolution, and is why today’s Activists need to work at evolving big, awake hearts full of joy and wisdom and kindness, as this will endow us with the necessary sacred fire and passion not only to enable us to fight for those causes which we believe in, but to do so in the right way. Being a spiritual person today requires so much more from us than just being good at meditating or doing our tai chi regularly, or whatever it is we practice. It also has to transcend our quest solely for our personal freedom and needs to incorporate our relationships with our fellow human beings and with our society. Today, we are all called to operate out of the realisation that whatever our national, racial or cultural backgrounds, that essentially who we are, are planetary citizens and that despite our many differences, we all come from one common ground of being and all have a responsibility to serve the emergence of a healthier world. As Gandhi put it: ‘We need to be the change we want to see happen’. This means that it is not enough just to know about what is wrong with our world; rather, we need to make an effort to live our words, to embody the truths we feel emerging inside our hearts. Being an Activist then, means being active – doing things, taking responsibility not only for how we live and the kind of energy we are giving out at any time, but also for the well being of our planet. So whatever our particular sphere of work, we are all challenged to treat our fellow human beings with love and respect, to go out of our way to help those in need, to minimise our carbon footprint, to take strong stands for those principles we believe in, to speak our truth and to respect our planet. No hiding of our light under bushels! And of course we need to be especially active in those areas that particularly concern us and where we feel we have a particular contribution to make, be we political activists, peace activists, save-the-polar bear activists, or whatever. We need a new culture on our planet. Our old world is not working any more. The old order is dying. Our institutions are crumbling. I stress once more: a better world is not going to be ushered in by anyone else but ourselves. No one or nothing is going to rescue us or ‘do it’ for us! So, to conclude, being an Activist in today’s not un-perilous times is about our not being afraid to get our hands and feet wet in the service of whatever cause or causes touch our hearts and so move us to commit to them. The kinds of people who most inspire me today, are those who work trying to resolve conflicts in some of the most perilous parts of the planet, or who try to rescue women and children from slavery or forced prostitution. I am deeply touched by the bravery of the Aung San Suu Kyis of this world who single-handedly take on rogue regimes and persuade others also to stop fearing tyrants. I have recently been moved by that extraordinarily courageous young Afghani woman, who, despite being shot in the face at close range by a Taliban fighter, is undeterred and vows to continue her fight to have women be educated. How awesome. I hope she wins the Nobel prize. ‘Anybody can serve. You don’t have to have a college degree or know about Plato and Aristotle to serve…. You only need a heart full of grace and a soul full of love’. 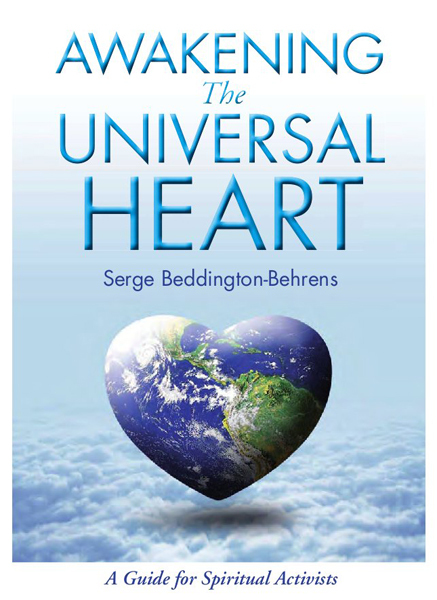 To show how to ‘grow’ such a heart and soul, and what we can each consequently do with it to usher in a better world, is what this book is all about.